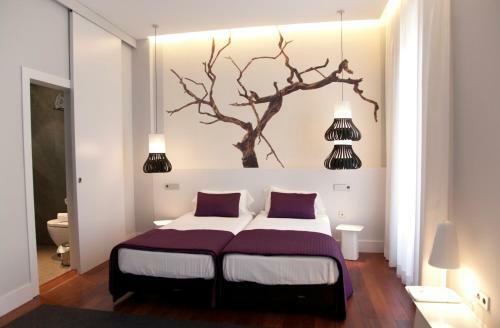 This charming design hotel is just 100 m from Granada Cathedral, in the heart of the historic city centre. It offers stylish rooms with a private balcony overlooking Plaza Bibirrambla and a shared terrace. The spacious, air-conditioned rooms at Khu Hotel feature modern décor. Each one comes with free WiFi, a flat-screen TV, minibar and a private bathroom with a hairdryer and free toiletries. The hotel is 250 m from Trinidad Square. Just 5 minutes' walk away you will find Elvira Street, famous for its tapas bars. Sierra Nevada Ski Resort is 40 minutes' drive away and Malaga Airport is 134 km from Khu Hotel. This hotel is 1352 metres from the Alhambra entrance, 346 metres from Plaza Nueva (the absolute centre of Granada), 1477 metres from the train station and 3024 metres from the bus station.